I have very very fond memories of lantern parades when I was a kid. Every November, for St. Martin's Day, my kindergarten group would meet on a dark afternoon in the Allee that led along a river through the heart of our small town; we were walking hand in hand, proudly holding our lantern with a small votive candle inside, fervently singing songs. Ich geh mit meiner Laterne, und meine Laterne mit mir. The parade was headed by one of our male teachers, clad in a red robe, riding a horse. At the end of the afternoon, there would be soft sugar pretzels. 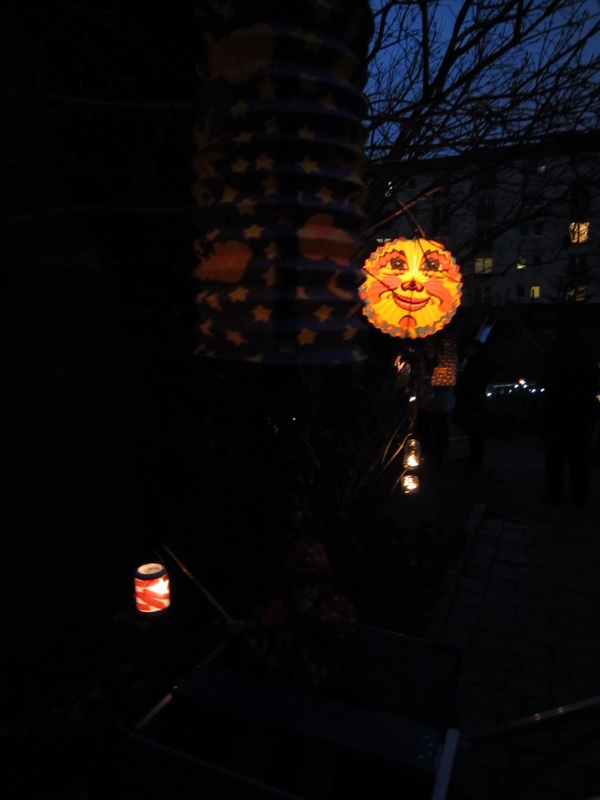 I was happy when I heard that Nova's preschool also organized a lantern parade. But things are different these days. Instead of little candles burning in the lanterns, there were plastic rods with little mini light bulbs and batteries. There was no mysterious dark alley, covered by maple trees, but the grey streets of Berlin. No horse, no sugar pretzles. A light rain. When the parade was over and we all headed back to the Kita garden, candles were glowing in the trees, hot pumpkin soup was served and we had the first Glühwein of the season. The parents talked about their memories, and the kids were playing in the dark garden. After living in Los Angeles for 5 years, I have come back to Berlin with my family; post by post, I am chronicling all my favorite Berlin places old and new.